Google has launched a unified messaging app Hangouts at Google I/O, it will replace all Google’s messaging apps like Gmail chat, Google+ messenger etc. Google took so long to release something like this which works with all Google services. Earlier it was rumored to be called Babel, but Google announced it as Hangouts, the term is already associated with Google+ and it sounds cool. The app not only unifies messaging services but it is also a cross platform app, it works on Android, iOS and also on desktops Windows, Mac and Linux via a Chrome extension. Google has also announced Google+ redesign, Play Games Service and Google Play All Access Music Service at Google I/O. Now a days there are a ton of messaging apps those work as truly cross platform, for example the WhatsApp, the recently announced BBM for Android and iOS. Google’s Hangouts will compete with all these apps but Google has an advantage as its user base is quite large and already using some of its communication tools earlier. The aim behind the Hangouts release is unifying the Google’s messaging services, it has different massaging tools like Gmail chat, Google+ messenger etc., now this Hangout will replace everything. Using Hangouts you can add photos and emoji icons for the conversations. All your hangouts conversations will be saved back to the cloud so that you can retrieve the conversations to see what you said some time back. You can see when people are typing, whether they have seen your message. 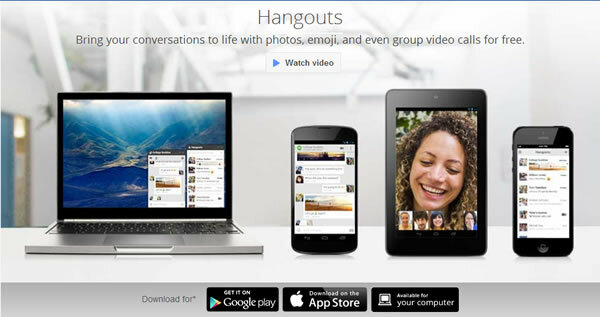 Like Google+ Hangout video chat this app also supports upto 10 people for a video chat. You can always message your friends even when they are offline like any typical messaging app. Hangouts always stay in Sync and as they work across devices you can continue them anywhere, if you clear notifications in one device they changes will reflect on other devices too. You will be able to snooze notifications if you are busy with something else. One major feature that is missing in this app is the Invisible Mode found in Google Chat app.